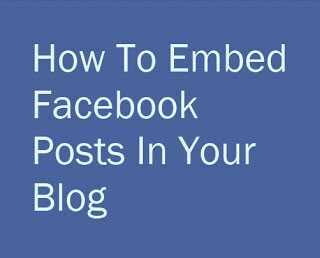 It is been not so long ago when Facebook let limited Facebook users to embed post from Facebook to blogs and websites. But, now the wait is over, anyone can embed Facebook updates to their blogs and websites. With the launch of embed post features for everyone Facebook has also announced that people can embed videos from Facebook directly. 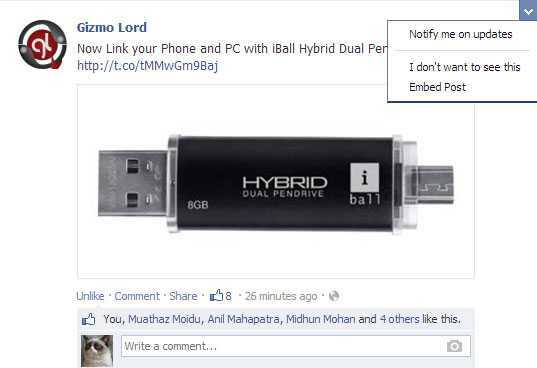 Facebook has also optimized this embed feature for mobile devices. If someone is viewing the embedded post from a mobile device, that person can see the embedded post exactly fitting to the mobile screen width. In mobile devices we can see larger like, comment and share button with the embedded posts. So, that we can easily like, comment or share the embedded posts. This is very helpful for touch screen mobile because people can easily touch those buttons. Previously YouTube and Twitter allowed to embed videos and tweets respectively. Now, it is Facebook’s turn, now that anyone can embed Facebook updates it will be interesting to see that how many people are using this feature. With the release of this Facebook post embed feature of everyone, WordPress also updated the Facebook plug-in to a new version which adds embed post features along side all the current features it has. Below image show how you can get the embed code for a post. Just click on the drop down option on the post, click on embed post and get the embed code for the post. So, have you tried this feature? If not then try embedding posts to your blog and tell us how you feel about this new features?